I’ve been craving something stew-y for a while and finally got the chance to make it while at a friends house. Sure, I couldn’t start til 5PM and it took nearly 4.5 hours to finish and is an extremely time-consuming, complicated dish but it was so worth it. So, so, so worth it– Fall off the bone short-ribs, salty, sticky stew, and sweet veggies. So great. Lardons are such a great addition to this– technically, lardons are a cube or strip of pork fat but they can be attained by using cured belly meat such as bacon. Although lardon meat is not typically smoked (it’s cured), I think crunchy bacon adds a salty tang and crunchy bite to the stew. And it’s bacon. Come on. Bacon. Season short-ribs with salt and pepper and brown all sides in a large dutch oven for about 6 minutes over moderate-high heat. Do not over crowd, do one batch and set the meat aside, then do the rest, remove, and let rest. In the same pot, reduce the heat and cook the chopped onion, celery, and 4 of the carrots for about 7 minutes until softened and onions are slightly golden to make a mirepoix– a fancy name for a combo of uh, onion, celery, and carrots. Deglaze with red wine vinegar, wine, and tomato paste and boil until the alcohol has been removed and it is reduced by half. Add your stock, bay leaf, thyme, and water and bring to a boil. Add ribs and any liquid and blood that have accumulated. Cover and stick the pot in the oven until ribs are extra-tender. This will be 2.5 to 3+ hours of sitting and waiting but it’s so worth it. The bones add so much flavor and the low temperature really make the meat tender. 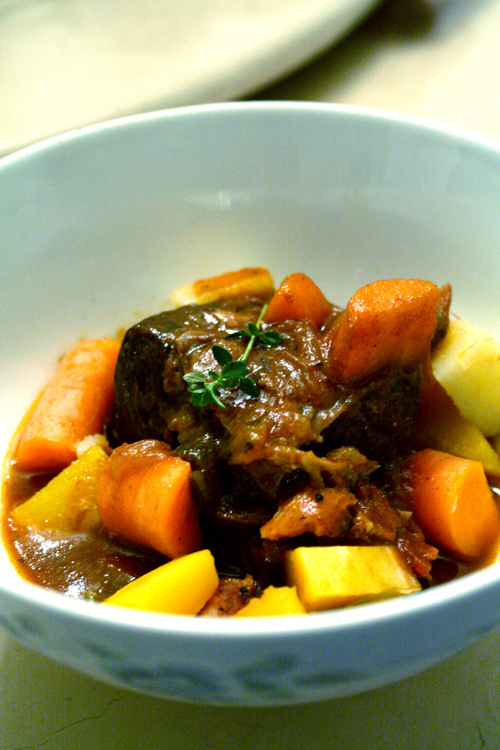 While the short-ribs are cooking, chop turnips, half a butternut squash, and the rest of the carrots and parsnips into bite-sized pieces and set aside in the refrigerator. Remove the short ribs from the oven. Remove the short-ribs from the sauce and separate the meat from the bones, being careful not to tear the meat too much and discard the bones. Trim as much fat and connective tissue off as possible. Let the pot sit for 30 minutes to allow the beef oil and fat to rise. Skim AS MUCH AS POSSIBLE– it will be an orangish oil that rises to the top. At this point, fry up your bacon until crispy and slightly burnt (or however you like haha). Dry on paper towels and chop into small pieces. Return short-ribs and bacon to dutch oven. Boil the soup until the broth has reduced and become more sticky (10 – 15 minutes). This is also a good opportunity to skim fat as it accumulates to the center while it boils. Again, try and remove as much as possible. It’s pretty gross and fatty haha. Meanwhile, take the rest of the chopped veggies and boil in salted water for 6 – 7 minutes, until very tender and dump them in iced water to stop cooking. Butternut squash and turnips should be in separate pots as they don’t take as long to cook. When finished, portion beef chunks into individual serving bowls and top with soft vegetables. Ladle some sauce and serve over mashed potatoes or celeriac puree.